Summer is so close, we can almost taste the barbecued burgers and apple pie. And turning the calendar page over to June also means we’re that much closer to the start of the 2015 Susan G. Komen 3-Day® season. Here are a few fun and exciting June announcements from your friends at the Komen 3-Day. A Delightful Discount to Help You Grow Your Team – The impact, camaraderie and enjoyment of the 3-Day® is so much stronger when you share it with friends. To nurture all those growing teams out there (or inspire new ones to start), we’re giving walkers $20 off their registration fee when they sign up with the discount code TEAM20. This special teambuilding discount expires at 11:55 p.m. CT on June 8th, so you need to act quickly. Show Us What FRIENDSHIP Means to You – Our monthly Instagram photo challenge theme for June is FRIENDSHIP. To play along, simply post a picture (or two, or ten!) to Instagram, showing what this theme means to you. 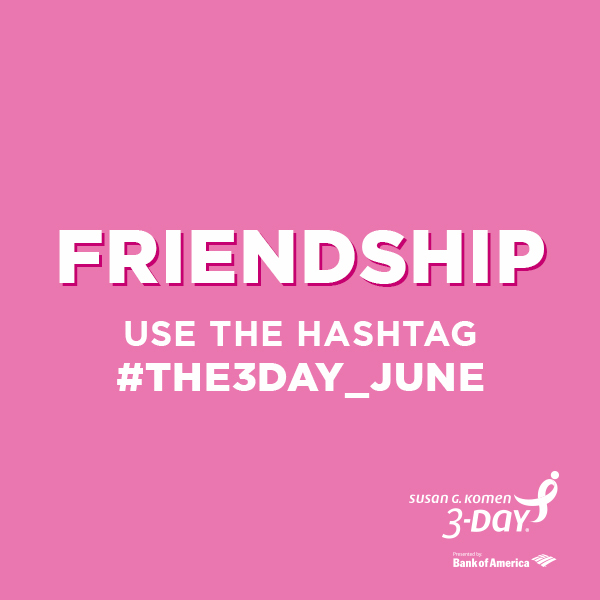 Be sure to include the hashtag #The3Day_June; you can also search this hashtag to see what others are posting! 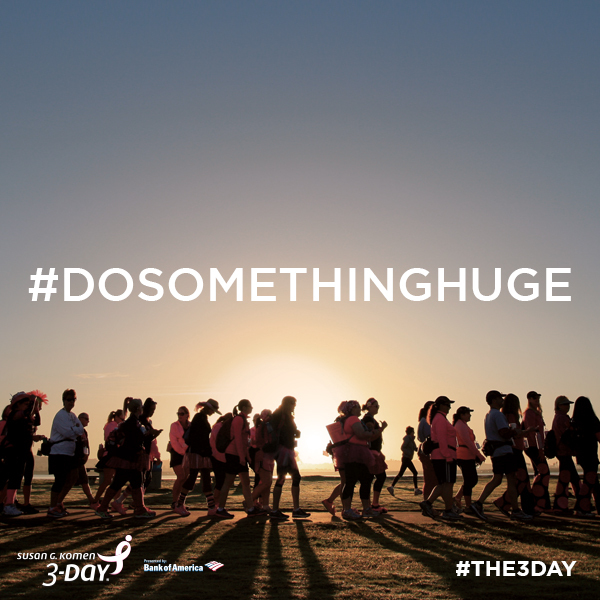 See Your Pics on a 3-Day Photo Banner – As long as you’re shooting, posting and hashtagging your fantastic 3-Day-related pictures anyway, don’t forget about our ongoing #DoSomethingHuge photo challenge. Since February, we’ve been collecting every picture posted to Instagram with this hashtag, and we’ll be compiling all of these pictures into a beautiful photo mosaic banner which will be on display at every 3-Day event this year. We want to include photos from as many 3-Dayers as possible, so be sure to post your pics with the hashtag #DoSomethingHuge; the deadline for photos to make it onto the photo banner in June 15.